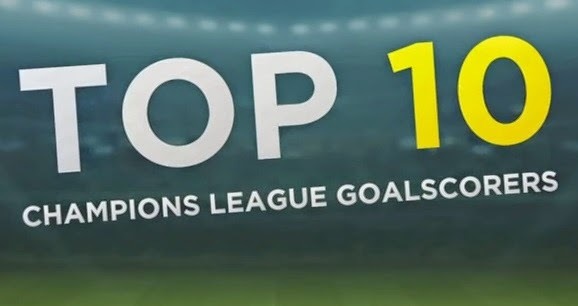 Top 10 Champions League Goalscorers: Ibrahimovic, Drogba (Cheslea), Henry (Arsenal), van Nistelrooy (Manchester United), Ronaldo (Real Madrid) and Messi (Barcelona). Below are the top ten Champions League goalscorers of all-time. Real Madrid, Barcelona, Manchester United, Chelsea, Arsenal and AC Milan all are linked. Real Madrid striker has scored 41 goals in 69 Champions League games for Lyon and Madrid, making a 0.59 goal per game ratio. Paris Saints Germain attacker has netted 42 goals in 105 Champions League appearances for six different clubs, making a 0.40 goal per game ratio. Chelsea legend has scored 44 goals in 91 games including the winning goal against Bayern Munich which secured the first Champions League title for the Blues. AC Milan legend scored 46 goals in 81 games in his 15 years of career. Currently, he is the manager of AC Milan. The Ukraine international scored 48 goals in 100 Champions League games for Dynamo Kyiv, AC Milan and Chelsea. Arsenal legend who recently retired from professional football netted 50 goals in 112 games for Monaco, Arsenal and Barcelona. The Dutchman scored 56 goals in only 73 games, making a fine average of 0.77 goals per game. Los Blancos legend scored 72 goals in 142 appearances, making a 0.50 goals per game ratio. Another Madrid star who has also bagged 72 goals but in 108 games. He is superior in goal per game ratio (0.66). Four times Ballon d’Or winner has scored 74 goals in only 91 games, making 0.81, the best goals per game ratio.